An Associated Press article by Candice Choi describes the dairy industry’s response to growing disillusionment with dairy products (“Milk industry fights ‘anti-dairy folks,’” The Elmira (NY) Star-Gazette, 1/27/15). Julia Kadison of the Milk Processor Education Program is quoted as saying that the breaking point came in 2014 “when the British Medical Journal published a study suggesting drinking lots of milk could lead to earlier deaths and higher incidents of [bone] fractures.” The dairy industry is responding with a social media campaign “trumpeting the benefits of milk.” Trumping up is more like it. They like to cite the “decades of research reinforcing low-fat milk as one of the most nutrient-rich beverages available.” One problem with that statement is that low-fat milk does not exist in nature: it has to be manufactured from “whole milk” which, as the quote implies, is not an ideal beverage for human beings, as it is rich in saturated butterfat. Removing the fat also removes the fat-soluble vitamins which must be added back to make it complete. However, removing the fat and its calories creates the illusion that it is that much more “rich” in other nutrients, such as protein, minerals, and the water-soluble vitamins. This illusion arises because nutrient-richness is based on the amount of each nutrient per caloric amount: when you remove a lot of the calories, you can drive the other numbers way up. And what are the other beverages that milk is being compared to, anyway? Water, of course, does not have any nutrients to speak of, yet it is the ideal beverage for all animals other than infant mammals. The principal beverages that the milk industry likes to compare its product to are soft drinks — which are loaded with empty-calorie sweeteners. You won’t find the milk industry comparing its products to green smoothies anytime soon. Furthermore, the nutrient-richness of a food is not all one has to be concerned about health-wise. It is not even the reason why milk is criticized. It is the harmful components that come along with the product. First, it was the fat that was recognized, and now often removed; but it is also the protein, which contains growth hormones. Some growth hormones are injected into dairy cows, but most are naturally there to promote growth in the calf. Growth hormones are implicated in higher cancer rates (especially breast, prostate, ovarian, and testicular cancers) in people who consume dairy products on a regular basis. There is also strong evidence that casein, a principal protein in cows’ milk, raises blood cholesterol levels in people: thus even low-fat milk is bad for your heart. Other harmful components of animal milk as compared to plant-based milks is that it comes from beings higher on the food chain, and is thus more contaminated with environmental pollutants. The article cites the critics of dairy, ranging from paleo diet advocates who shun it purely for health reasons (based on a historical perspective) to animal welfare advocates for whom the cruelties of the industry are a reason to move past this barbaric practice. The presence of many alternatives in the marketplace (such as almond milk, which according to the article has seen a whopping 39% growth in sales over the past year) makes it easier for people to change, and thus leaves the dairy folks feeling that much more threatened. According to the U.S. Department of Agriculture, in 1970 Americans drank an average of 21.8 gallons of milk per year, and in 2012 they drank 14.5 gallons – a 33% decrease in milk consumption. One of the best things vegan activists can do is to provide samples of plant-based milks (almond, rice, oat, soy, coconut, etc.) in order to inform the public of the many alternatives to milk from animals, which has been found to be unhealthy for people, the environment, and is now generally produced on large factory farms with a lot of cruelty to animals. Dairy Management Inc. is a dairy lobbying organization which is partially funded by the U.S. Department of Agriculture — thus, it receives tax dollars. If the dairy industry, instead of clinging to their products of the past, would expand its definition of dairy products to include plant-based milks, cheeses, and yogurts, we would all be better off, and they would not have to pursue their costly propaganda campaigns. Soak oats and raisins in water for at least 1 hour (overnight in refrigerator is optimal.) Add salt if desired, then shake and use as is, or blend for 15 seconds in blender for creamier consistency. If using seeds or nuts instead of oats, after soaking, blend them with just ¼ cup of water for 10 seconds, then add rest of water and blend again for 10 seconds more. Makes about 2 cups. 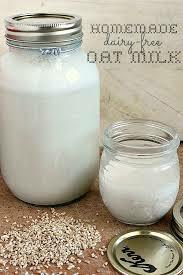 If a whiter “milk” is desired, remove raisins from soak water prior to blending and save to eat later if desired. Some of their sweetness will still be present in the soak water. If milk without raisins is not sweet enough, a sweetener such as rice syrup or maple syrup can be added. Cows’ milk has a higher sodium content than grains, so a little salt will duplicate that taste, but it is by no means necessary (or healthful, especially if hypertension is an issue for anyone in your family).